Aquion Energy’s Aspen 48S-2.2 battery is a modular building block for clean energy storage systems. Based on Aquion safe, clean, and sustainable Aqueous Hybrid Ion (AHI TM) technology, the Aspen 48S-2.2 is engineered to meet Cradle to Cradle certification standars. 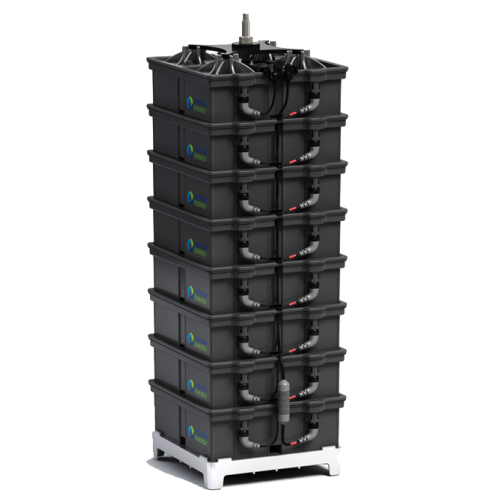 Designed for years of hassle-free operation in stationary, long-duration applications, AHI batteries are optimized for storing energy for residential, off-grid, and microgrid applications. The Aspen 48S-2.2 delivers an unmatched combination of performance, safety and environmental sustainability in a cost-effective battery platform. Aquion Energy bring a whole new type of battery to the market offering a safe, clean, non-hazardous, no hassle, recyclable solution. Based on Aquion’s proprietary Aqueous Hybrid Ion (AHI™) technology, their products are clean salt water batteries that outperform and outlast traditional battery chemistries. AHI batteries contains no heavy metals or toxic chemicals, they are also non-flammable and non-explosive making them the safest batteries in the world. The batteries are designed for stationary long-duration daily cycling applications including residential solar, off-grid, micro-grids, energy management and grid-scale services. The batteries can be easily connected in series or parallel, Aquion's AHI technology has inherit self balancing characteristics so a large number of parallel connections is not an issue with these batteries.